How To Stop The Body Battle. And! 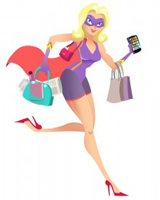 A Completely Fabulously Awesome Free Giveaway For You Today! I’m going to give you my brand new product package for free today. It’s my gift to you. But first, I want to share a little story. I spent years fighting to get the body I wanted. Back and forth I’d go between being ‘almost there’ (almost!) and then somehow, often quite suddenly, having it slip through my fingers. Gaining back an extra layer in a week or even less, sometimes completely unaware of it happening. Other times more consciously, almost as a cocky response to knowing that I was so close and feeling like I could now afford to relax a little. When I look back now, I wonder if perhaps what that really was was some sort of innate self-sabotage. What I really see is a girl whose thing was self-destruction on so many levels and in so many ways. And I don’t know, perhaps that’s one way to learn about the world and ourselves. Or perhaps it’s simply a pattern that can develop deep within our conscious in response to fear. The fear of not being good enough no matter what you do or how you look. The fear that even if you were to get there, you wouldn’t be able to maintain it or else the price paid would be too high. 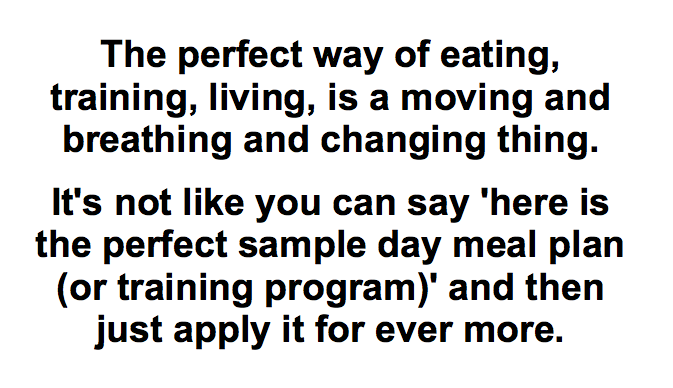 In the end, it wasn’t about, was never going to be about, finding that magic diet combination; that perfect training plan or ‘missing link’ supplement. I mean sure, I could talk for days about which supplements are best to balance your hormones and energy toward fat loss, about what style of training is known to blast through the extra layers once and for all, about what you need to eat to be happy, healthy and lean. So even though you do need to understand the principles of how to eat to get the body you want, you also need to be willing to learn to listen to your body and understand its changing needs within those rules. That being done, here’s the other thing and this is the real kicker. You don’t get the body you want simply by knowing how to train right and how to eat. Even by knowing and then also doing you don’t really get ‘there’. Ending the body battle comes down to following a holistic system for results. And after 14 years doing what I do, I know how to work with someone to achieve lasting transformation rather than a quick fix that may or may not even really make you feel happy, confident, in control and proud of your body. With my private fat loss clients I use a proprietary system that I’ve developed over through years of personal and professional experience, and today I’m going to share the highlights of that system with you. Learn how to listen to your body. Of course you need to understand how to eat right, but you need to also learn how to be flexible within that and how to know intrinsically what your body needs. Train consistently, hard. Quality and the right quantity. Typically I recommend 3-4 weight lifting sessions a week and 2-3 ‘sweat’ sessions, which may be intervals or a weight-based circuit. This is exactly the sort of training you will learn in my training plan, and it caters for home as well as gym training, and also includes some under 15-minute workouts for when life is crazy. Get your head right. Figure out exactly what you want, why you want it. List out the benefits as well as the fears. Learn to deal with negative self-talk and sabotaging behaviours. I spend quite a lot of time with my private clients getting to the heart of sabotaging behaviour and helping them to break free of patterns that have held them back in the past.This is really important stuff, and you won’t get results without it. Support with basic supplements.We all have to face over 500 toxins a day just by walking around. That requires a lot of nutrition. Stress, poor digestion, and a bunch of other things can also rob you of nutrients. Basic supplements like a multi vitamin, magnesium, fish oil, digestive support are essential if you want to get lean. It’s also helpful to support the nervous system and balance hormones, as these things can stop you getting lean no matter how well you eat or train. Make it practical. Of course you have to make space in your life to eat and live well. But at the same time you want to make it work for you. If you have a young family, don’t go signing up to do daily sessions at the gym if you know you’re just not going to go. Start with 2 or 3 a week, build the habit and go from there. With food, if you get home late and/or stressed and tired, don’t kid yourself you’ll cook from scratch every day. Do batch food prep or even prepare dinner food in the morning. Celebrate your milestones no matter how small!A sure-fire way to guarantee failure is to just push yourself to each next step without ever stopping to enjoy and acknowledge the previous one. Give yourself a pat on the back and a small reward or celebration for each milestone you cross. Soon I will be launching my completely revamped website – exciting! As a prelude to that I have created a free podcast and ebook for you to download. 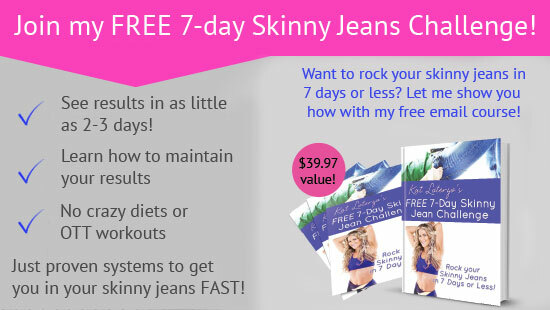 It’s called 6 Steps To Get The Body You Want, and goes into detail on the 6 key elements for lasting transformation from my Change Your Body For Life Fat Loss System. You can download it right away, today, and it’s absolutely free! 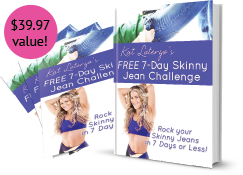 Click here to get my free podcast and ebook, 6 Steps To Get The Body You Want. PS I know it might seem like it’s a battle you’ll never be able to win. I know what it’s like to yoyo back and forth, to feel like maybe things are getting better and then to have it slip away. You CAN end this fight. You CAN change your body, and change your life.